Anyone who has dealt with me knows that I am a big advocate of people in the jewellery industry servicing what they sell. This is an example of the lengths I go to for my customers. The chain - I sold it in 2006 but I did not make it. The chain is 9ct yellow gold and weighs 60 grams. This is a heavy chain and I have included a wedding ring in the photo for scale. I sold it back in 2006. Machine made chain is one of the few things that I do not make myself. I recently wrote an article about hand making chains and why the hours it takes puts them out of the budget of most people. A pile of jewellery chain product in need of repairs. When I wrote that article about hand making chains I soon got an enquiry from someone who had seen the article and emailed wanting me to handmake a chain for them. It was obvious that they never read the article, just saw the pictures in it. So right up front, before anyone thinks this is me seeking repair work, I want to state I do not do repairs and have not for many years now. This article is about me servicing what I sell. 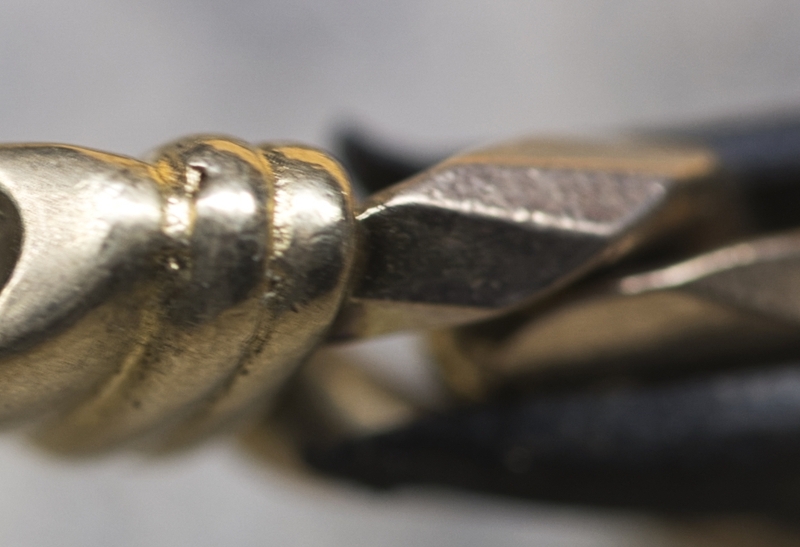 As I always recommend, if your jewellery needs repairs please take it back to where you purchased it for servicing. All of my customers know that I service/repair everything I sell and make. This article is to highlight what can go into doing a repair properly and how I service products I sell. Why do chain ends wear out so fast? The catch goes to the top behind your neck. When gold rubs against gold we get wear. Movement and force are two factors in the rate of wear. The greater the applied force during that rubbing/movement the greater the wear. The creator of force in the wearing of a chain is its own weight. However that weight is not evenly distributed during wear around your neck. As you hang a chain around your neck you usually place the catch at the top out of sight. This results in the catch area carrying all the weight of the chain whilst the rest of the links in the chain progressively carry less weight as we move down. 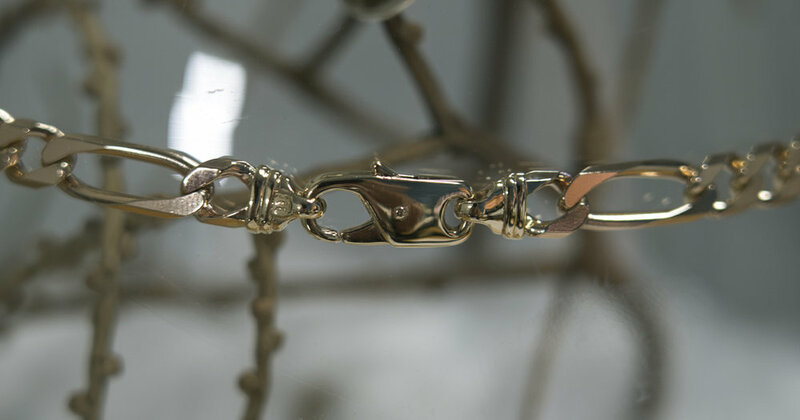 In a very old chain you often see the links either side of the catch very badly worn whilst the middle of the chain, which usually hangs to the bottom, is still in reasonable condition. What needs to be fixed with this chain? In the gallery above you can see photos of the worn out chain ends and the catch. The quickest way to repair these would be to fill the worn areas with solder and metal. Frankly this often ends up with a weak piece of metal and unsightly joins. Probably not something you want securing a 60 gram chain around your neck. I wil remake them stronger than they were originally. The chain is a redder 9ct yellow gold than the chain end. In a recent article I wrote I mentioned that very often chain manufacturers do not make the catches that secure their chains. Article link: For your benefit or theirs? In another article I discussed the vast array of precious metal colours even when those metals are all considered to be 9ct yellow gold for example. You can see in the photo to the right that the chain end and the chain do not match. The chain is redder in colour. Article link: Why I often recommend someone else make your wedding ring. Same chain, different colour! Why? This difference in colour would not have been visible when the chain was new because it is industry standard practise to gold plate 9ct yellow gold chain to make it look a richer gold colour at the point of sale. This would also hide any colour variation between the chain and the catch areas. Oh no, that chain manufacturer closed! Ideally I would ring up the Australian manufacturer of the chain and order a replacement catch and chain ends rather than repair them. This catch was a non standard design, quite large and not readily available elsewhere. The Australian jewellery industry is going the way of our car industry. Very little local manufacturing as imports supply most of the market. That forced the manufacturer of this chain to close up shop back around 2010 if I recall correctly. To replace the parts of this chain I would need to make them myself. To avoid doing that from scratch what I did was take a pattern of the parts in their current state of disrepair. The pattern of the catch. After I cut the pattern open and removed the catch I injected wax into the cavity giving me a replica. 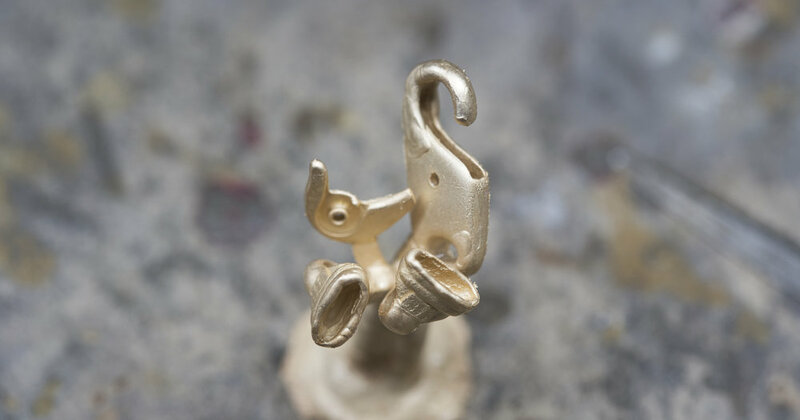 I then repaired the catch in wax and lost wax cast it in one solid join/repair free new piece. You can see in the photos below of the lost wax cast pieces the areas I have built up using wax. Filing these back to the correct shape is quicker and easier once they are in metal. You might also be able to see that where I could I made the pieces stronger/heavier than they were new. The lost wax cast pieces still on the casting tree. The pieces built up to heavier/stronger than the original. A lot of Italian and some Australian made 9ct yellow gold chain has a higher copper content than generally used. That is the case with this chain and why the chain ends and catches did not match the chain in colour. When I remade them I used a 9ct yellow gold alloy that I think ended up creating new catches and ends that match the chain much better. Down side is I now have a heap of extra gold that does not match the 9ct yellow gold I use. I will have to send that off for refining at some cost. After reading all this I think it should be clear that doing things properly takes time, time and cost that I more than likely will not get immediately rewarded for. I like to do things properly and I can only afford to offer this level of service for products I have sold and customers that support me. Make sure the person you purchase your jewellery from stands by their product. This is important in a world today where a lot of the jewellery I see is either not repairable or is more expensive to repair than make.